This TVNZ ‘home show’ explores 90s grand designs and their architects, renovation dilemmas and Kiwi personalities in their houses. 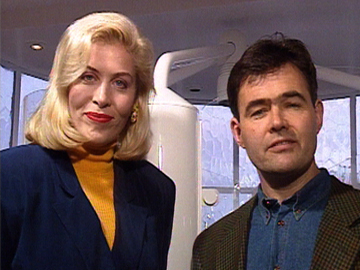 This debut episode is presented by actor Jennifer Ward-Lealand and builder (and future Dunedin mayor) Dave Cull. Ward-Lealand visits architect Roger Walker in his pastel pink and green Tinakori Road home, intros a “70s Cinderella” bathroom do-up, and drops in on DJ Kevin Black’s arts and crafts-style mariner’s cottage. Cull tests a non-stick frying pan and a barn house. Date stamps include denim shirts and a saxophone theme tune.